We had a real treat last Saturday when the rapan hirik weavers walked the one and a half hours from Maquili to Vila Mau-Meta to show the Boneca ladies and myself how they make the fibre for the weaving as well as the weaving of Rapan Hirik. 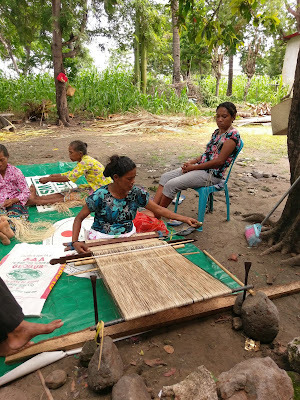 The woven fabric is a form of tais but is woven with fibre from the rapan hirik palm. It makes a fairly coarse thread, but makes a fairly supply cloth. 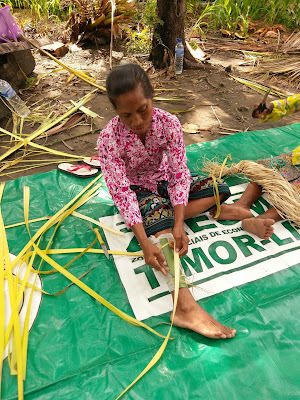 Rapan hirik was traditionally woven on Atauro Island until demand for it diminished with the availability of cheaper thread and synthetic materials , and cheap tais from the much larger Indonesian market. 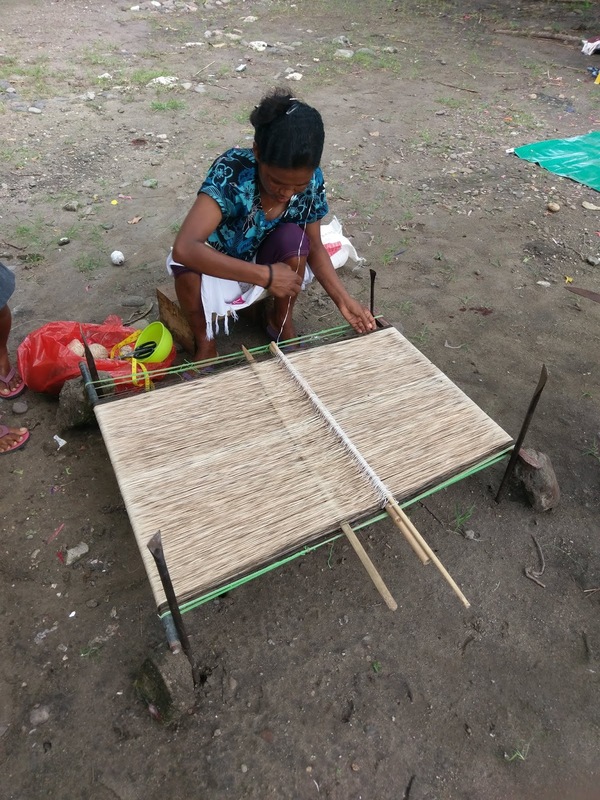 Fortunately there has been a bit of a revival happening in the weaving of the fabric due to Boneca de Atauro using the fabric for a number of things they make, like bags, wall hangings and pencil cases/wallets. And younger women are involved in the weaving of the rapan hirik as they see some economic viability in producing this most traditional of fibres and woven fabric. 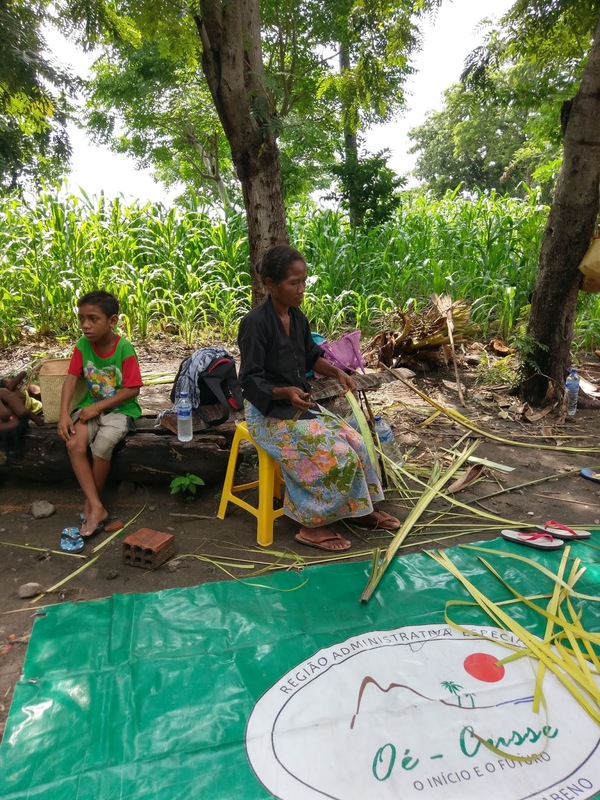 The first part of the process is to sort the leaves from the Rapan Hirik palm and split them into individual fronds, ready for stripping down to the best fibre part of the leaf. This process was demonstrated by Tereshina Lopes ( who also helped with the making of the fibre thread). The next photograph shows Luisa Ellu Setting up the warp on the back loom, which was made by placing spikes in the ground. The process of creating the warp took all morning to make roughly 1.25-1.5 metres of fabric. Then it was onto weaving of which only a small amount could be done because the rain decided to arrive. It is the wet season at present so when the rain comes if buckets down and everything has to be packed away. 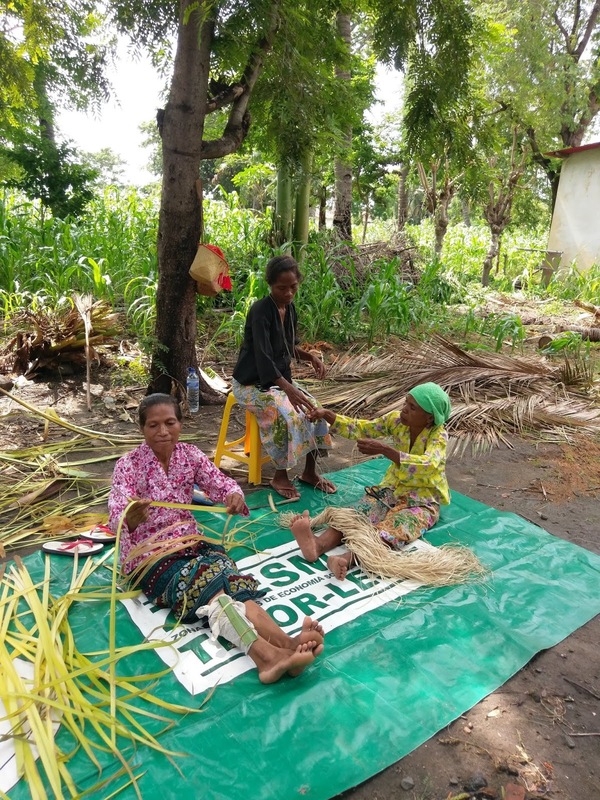 The lady on the right is Herminia de Costa, who wound the thread into balls of thread to facilitate the weaving process and also helped out with other tasks in setting up the back loom. I am just amazed with how little these women can create such wonderful cloth and it is an ode to the creativity of the human and women really. 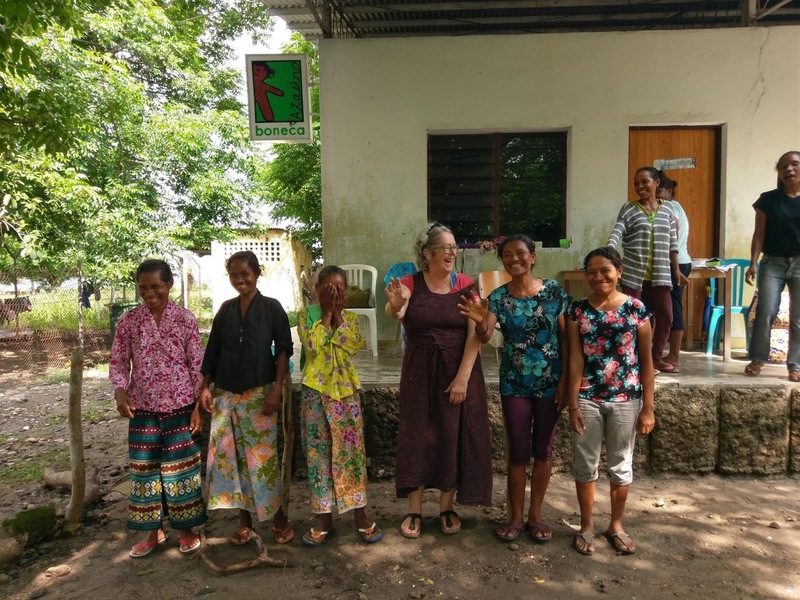 We had to have a group photo at the end of a wonderful day and of course we had to have a little rungu ranga in the photo, because everyone needs a little craziness as part of their creative day! Fund Raising Progress: I am still fundraising for the two airfares ( and insurance) but thought I would update you as to how the fundraising has gone so far and am extremely grateful that we have reached the point of almost funding one airfare. Thank you for helping us reach this point! I hope we can reach a sum of money for both airfares and insurance. I must admit I was not sure how this fundraising would eventuate but am so grateful for your support, as are the ladies at Boneca de Atauro. When I told them that we had almost reached the point of funding one airfare they decided that they would like to reward donations of $50 or more with a small gift of their appreciation ( it will include a small piece purse made with rapan hirik and a small surprise)- which I will send once I return to Australia, because the postal service in East Timor is all but non-existent.